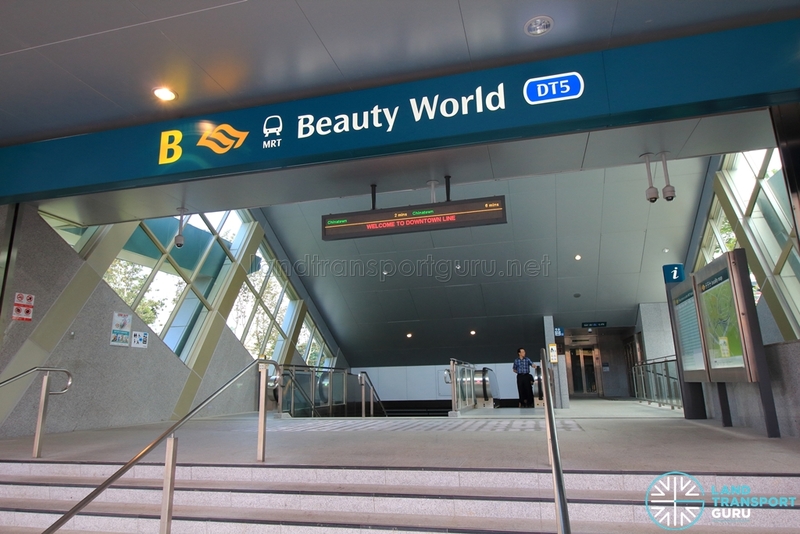 Beauty World MRT Station (DT5) is an underground station along the Downtown Line (DTL) Stage 2, located in the Anak Bukit planning subzone. It is built underneath Upper Bukit Timah Road, near the junction of Jalan Jurong Kechil, and serves part of the Upper Bukit Timah corridor, including the Toh Yi Estate. 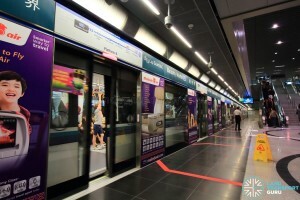 The station is located in the vicinity of low-rise private homes, condominiums, HDB flats, shophouses, commercial buildings, shopping centres and places of worship. Prominent landmarks include Bukit Timah Shopping Centre, Beauty World Centre, Beauty World Plaza and Bukit Timah Market & Food Centre. It bears the name Beauty World after a former amusement park in the area. Beauty World station has two platforms in an island platform arrangement, with both platforms utilized for trains travelling in either direction. Full-height Platform screen doors isolate the air-conditioned station from the tunnel environment, enhancing commuter safety and station comfort. A set of escalators, stairs and lifts connect to the concourse above. With the concourse level wrapping around the platform, the ceiling is two floors high at platform level, conveying a spacious feel. Passenger Information Systems, which are plasma display screens located at each platform, display expected train arrival times and key messages. Tactile flooring helps to guide the visually-handicapped from the platform to the exits of the station. Lifts and escalators connect the concourse to street level at three separate exits. A public toilet is located in the unpaid area of the concourse, near the Passenger Service Centre. The artwork presents the multi-cultural mix of language as the result of multi-culturalism, and invites the viewers’ aesthetic intuition to ‘hover’ between reading and looking. It comprises Chinese, Jawi, Tamil and Latin words and letterforms that were layered upon each other in rhythm patterns then sandblasted into the wall. Spanning 91.2 metres, it was created by Boedi Widjaja, 40, an Indonesia-born artist who has been living in Singapore for the past 31 years. 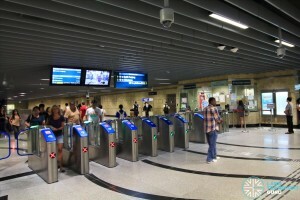 Beauty World station is one of six stations along the Downtown Line 2 designated as Civil Defence (CD) shelters, which will be activated in times of national emergency. Apart from reinforced construction, the stations are designed and equipped with facilities to ensure the shelter environment is tolerable for all shelterees during shelter occupation. These facilities include protective blast doors, decontamination facilities, ventilation systems, power and water supply systems and a dry toilet system. 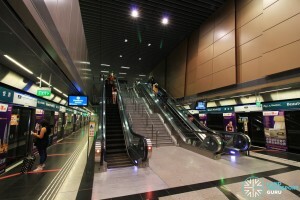 Beauty World MRT station has a three exits at ground level (A, B and C), all of which provide barrier-free accessibility. 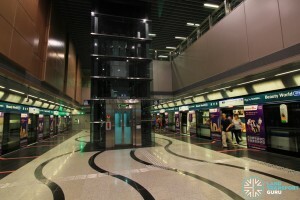 Beauty World station connects to four bus stops in the vicinity, as well as taxi stands and passenger pick-up points. There are four official bus stops linked to Beauty World station. Additional bus stops are included for a better representation of the area. Bus Stop 4, 42109 – Jln Anak Bt (Opp Beauty World Ctr), is not connected directly to Beauty World station. 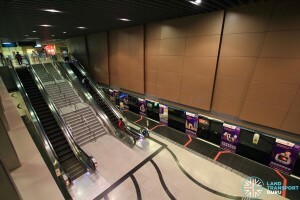 Commuters must use Exit A, enter Beauty World Centre and take the building escalator/lifts to the 4th floor. Next to the food court is a overhead bridge spanning across Jalan Anak Bukit; cross it to get to Bus Stop 4. In addition, passengers can board regular bus services at bus stops officially linked to Beauty World station for free rides. 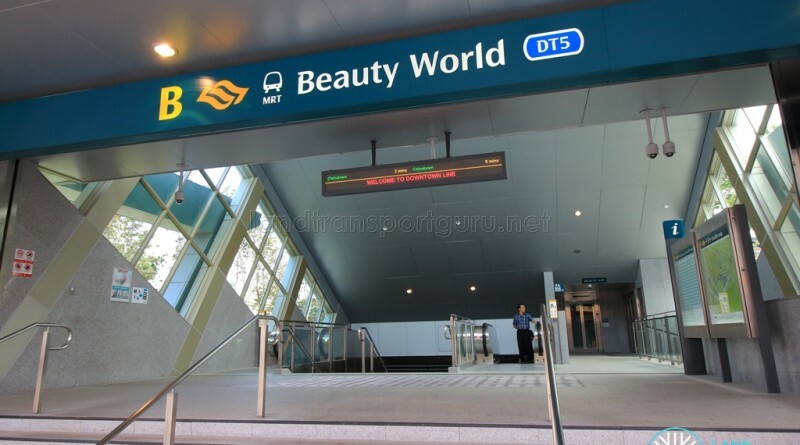 As a station along the Bukit Timah belt serving a mix of residential homes, commercial buildings and shopping centres, Beauty World station encounters moderate to high demand levels as a transport node serving the Beauty World area, connecting it to the rest of the rail network. Visitors to the area’s shopping centres and many food outlets operating from shophouses result in a decent flow of commuters in and out of the station throughout the day. 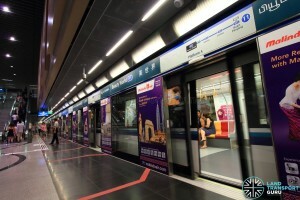 Downtown Line Stage 2 (DTL2) Contract 916 was awarded to McConnell Dowell S.E.A. 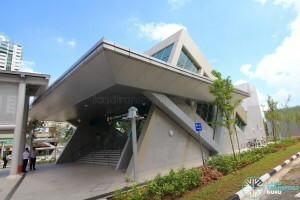 Pte Ltd for the design and construction of Beauty World station and its associated tunnels for S$339.88 million in Mar 2009.